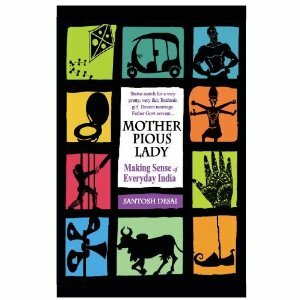 Mother Pious Lady contains a collection of essays on common Indian attitudes, mindsets and habits – the quirky, the inherited, the imitated, and the acquired. The author, Santosh Desai (one of India’s popular social commentators and columnists), has an enviable sense of humor and an inimitable style of writing that stems from a deep understanding of various subcultures within India. At first glance the title of the book intrigued me, but the words preceding the title— typical phrases found in matrimonial advertisements in Indian publications—elucidated the content. Having been born and raised in India, I didn’t need any further reason to pick up this book. Many books have been published on Indian history, its politics, emerging middle class, and varied landscapes. There are also numerous short stories offering a pinhole view into India from a superior perch outside. And recently, there has been flood of literature on India’s emerging status as a “rising star” nation. But Santosh Desai’s book is a breath of fresh air. This comprehensive collection of essays written by an insider (=Indian) provides welcome insight into the ineffable parts of India and its people. Each essay highlights the ethos of the emerging urban middle class through everyday situations and scenarios commonly seen and confronted in modern India and the India of the past. The essays are grouped under broader themes, so they can be read out of sequence, and although many of the essays were written for Indians, they can also be enjoyed by anyone who wants to understand India through its people rather than its economy and projected growth rates. Mother Pious Lady won’t offer much hope to business types trying to clinch a percentage of India’s vast market, but it will provide a profound perspective on the seemingly insignificant details behind the conundrum called India.